Artist Luis Jimenez died tragically in an accident in June of 2006. 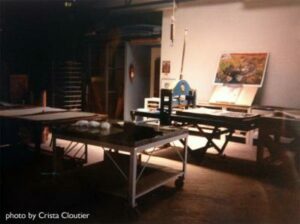 At the studio where I worked, Luis was the first artist I knew to pass away. Artists Fritz Scholder and Keith Haring had also worked with us and gone before him, but Luis was on my watch – and he was family. Luis Jimenez was inspired, charming, egotistical, accomplished, and cantankerous. In the early days, when Luis was first working at the press, he would sleep at the studio so that he could work on his lithography stones all night. But the focus, the drive, and the talent were still there. Though he was primarily known for his monumental sculpture, there was no greater draughtsman than Luis Jimenez.. Now he only slept in fine hotels. When he was just starting out, a local gallerist decided to take a gamble and give him a place in a two-person exhibition. But even that big gallery couldn’t contain his ego. Luis didn’t want a two-person show. Luis wanted a one-man show. The deadline for the delivery of work came and went. No work, no Luis. The day of the show arrived. No work, no Luis. The poor gallerist was beside herself. Doors opened, guests arrived. Everyone poured into the other artist’s room and the party began. That’s when Luis stormed in, a roll of butcher paper under his arm. He went into the empty room that was to be his. He tore a sheet of butcher paper off from the roll, sat on the floor and he drew. He signed the drawing and cast it aside. A curious by-stander snatched it up. Luis ripped away another sheet. Now everyone was interested in what this mad artist was doing. They began streaming in and surrounded him. Then they started fighting for the work. He couldn’t draw fast enough. The gallerist clutched fistfuls of checks and credit cards. The next day, all of Luis’s sculptures and prints arrived. Sight unseen, his show had already sold out. It was the start of an illustrious career. Artist James Turrell once told me that he’d privately nominated Luis for a MacArthur Genius Award. Luis would have loved that.The boy whose parents carried him from Mexico on their back to a new life in America, would become a highly honored superstar in the art world. Shortly before his death, I’d asked Luis to send me an updated resume. Instead, he faxed a handwritten account of his life. It was surprising in many respects, but mostly because it was uncharacteristically sentimental. A few days later, he called and asked me to forgive him for being behind on a project that we were doing together. I’d never heard Luis apologize to anyone. Ever. The following week Luis was killed when one of his monumental sculptures fell, pinned him to the ground, and severed an artery. He’d worked years on that piece and more than once I’d heard him complain that this project would be the death of him. And then it was. Luis had completed a print with us a few years earlier and asked me to put the entire edition in storage rather than release it to the market. It was an odd request, but Luis was going through a difficult personal period, so the prints were packed away as soon as the ink dried. After his death, I pulled the prints out. Denver Mustang with Airplane was a study for the sculpture of the same name that killed him. It was a beautiful print of a rearing horse, but each time I looked at it, I saw more. I saw Luis’ characteristic bold lines that continued right to the edge of the stone. I saw how wonderfully he captured the spirit of his own favorite horse. I saw a life dedicated to the fierce expression of talent. Luis Jimenez had a wild spirit that wouldn’t be tamed. It shows in his powerful work and it spilled into his professional life.I saw the end. I don’t advocate that any artist handle his professional obligations as Luis did, because Luis’ career paid a heavy price for it. He was a lone cowboy, a renegade who was willing to take those risks. But I believe that all artists harbor a wild spirit, and by connecting with it, by passionately protecting your spirit while putting it forward into the world through your creative expression, by believing with your whole heart and soul, you will make art that is strong and true. This is the lesson that Luis left for us. Join my mailing list and learn more about working as an artist. A free gift awaits you!